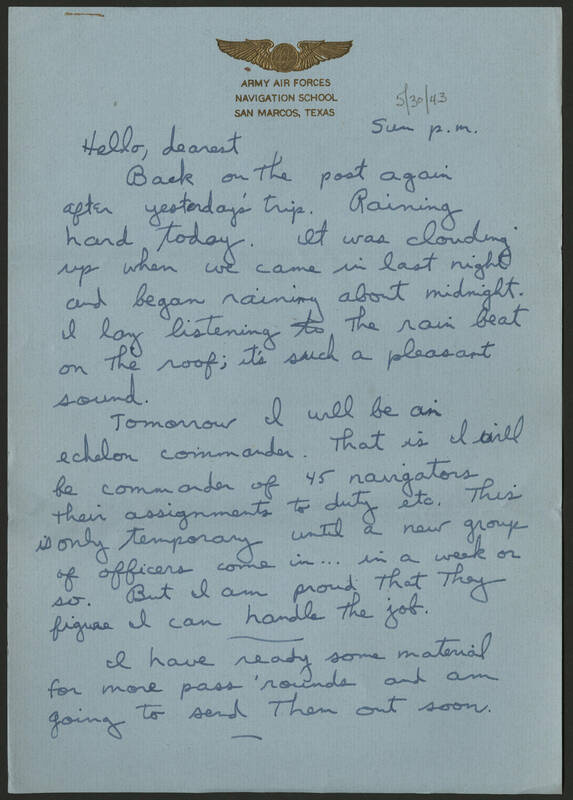 Army Air Forces Navigation School San Marcos, Texas 5/30/43 Hello, dearest Back on the post again after yesterday's trip. Raining hard today. It was clouding up when we came in last night and began raining about midnight. I lay listening to the rain beat on the roof; its such a pleasant sound. Tomorrow I will be an echelon commander. That is I will be commander of 45 navigators, their assignments to duty, etc. This is only temporary until a new group of officers come in... in a week or so. But I am proud that they figure I can handle the job. I have ready some material for more pass 'rounds and am going to send them out soon.